Zinc oxide nanoparticles (ZnO NPs) are one of the few nanoparticles synthesised industrially. This nanoparticle possesses a broad spectrum of application in rubber industry, optoelectronics, biomedical sector and pharmaceutics. With extensive applications the exposure risk also increases at the occupational and consumer level. The exposure to ZnO NPs may cause adverse reaction in the body. ZnO NPs are much toxic than their bulk counter parts due to its nano size scale. The toxicity of ZnO NPs is attributed to particle dissolution and induction of reactive oxygen species (ROS). The zinc ions released from ZnO NPs can disturb the metabolic process of the cells. The ROS generated can react with biomolecules causing damage in lipid membrane, proteins and DNA of the cells. Ecological interaction studies on ZnO NPs have indicated toxicity in a number of organisms like bacteria, earthworms, plants and so on. In vitro studies using mammalian cell lines report alteration in gene expression profile even at subleathal concentrations. This study suggests need for exercising precaution while handling ZnO NPs as the outcomes may not be visible. Exposure via parenteral and non parenteral routes reveals organ toxicity in rodents. Studies on human subjects have concluded that the dermally applied ZnO NPs in the form of sunscreens and daily care products do not penetrate skin. On the other hand inhalation exposure can be hazardous. Inhaled ZnO NPs mediated inflammation and histopathological lesions have been reported in rodent lungs. The inhaled particle can also reach other parts of body via systemic circulation. Translocation of ZnO NPs across brain through olfactory neuronal pathway has been demonstrated in rats. When administrated as intraperitonial injection, the nanoparticles can be detected in liver, kidney, and spleen. 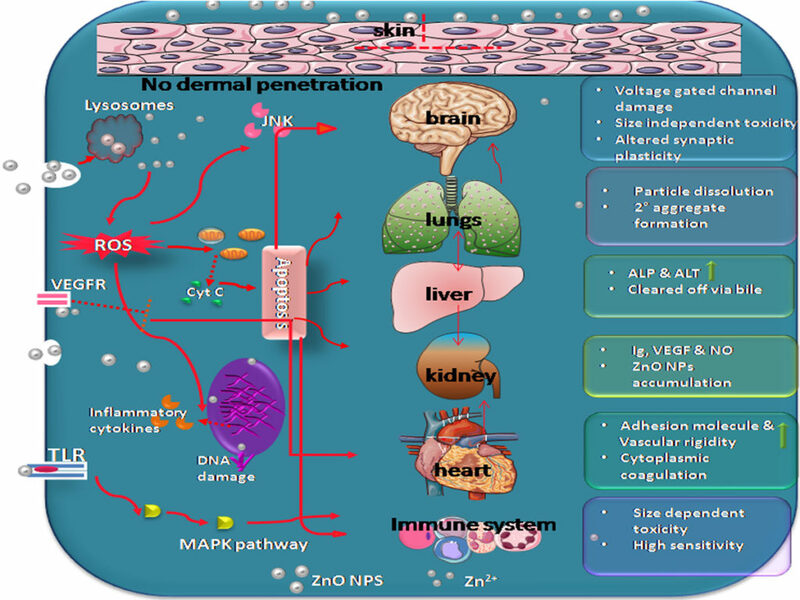 Moreover, accumulation in heart and cardiovascular toxicity has been suggested for ZnO NPs. Intraperitonial administration of ZnO NPs has found to increase zinc content in brain and interfering with brain mineral homeostasis. However the results available on the biointeraction of ZnO NPs are contradictory as there are no standard protocols available to assess the toxicity of nanoparticles. The toxicity results of nanoparticles can vary according the route of entry, dose and physicochemical properties like size, shape, surface charge etc. Besides, the extrapolation of data generated in laboratory animals to humans is difficult because of the interspecies differences. Yet the huge amount of toxicity data generated in different organisms should be considered as a warning sign when handling the nanoparticles. Proper regulations have to be established for the manufacturing, application and usage of ZnO NPs to prevent unforeseen outcomes. Engineered Zinc Oxide Nanoparticles; Biological Interactions at the Organ Level.